Summary: Learn how to fix a leaking mixer tap, fix a leaking spindle or spout, repack a mixer tap gland nut and replace a mixer tap O-ring. If you have a leaking mixer tap, you will need to find the cause before you can think about repairing it or buying replacement parts. There are three main places the tap is likely to have leakage problems. The first is the spout. If you notice water constantly dribbling from the spout then there is likely to be a problem with the gland nut or O-ring seal. 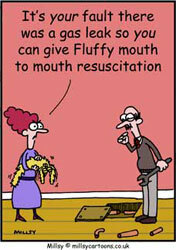 You do not need to shut off the water supply in order to make the necessary adjustments here. 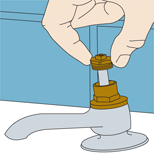 Unscrew the small screw in the tap handle and detach it from the rest of the tap. Lift off the metal shroud which will reveal the gland nut. The gland nut is the top nut on the spindle. Tighten the gland nut about half a turn. Replace the tap components and check the tap has stopped leaking. If not, then turn the gland nut a further quarter of a turn. 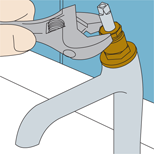 Do not over-tighten the nut as this will cause the tap to be difficult to turn off. It is possible to repack the gland nut. This will ensure the seal is water tight in future. To do this, unscrew the gland nut and remove the old packing using a screwdriver blade. 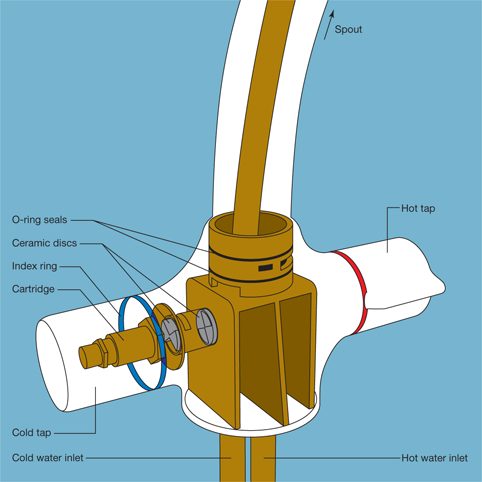 Using gland packing string or PTFE tape stretched out into a long thin length, repack the gland. Screw the gland nut back on and replace the tap components. Tighten the gland nut by about half a turn with a spanner. Turn off the water at the stop tap and drain the remaining water in the pipes by turning the taps to the ‘on’ position and leaving them until no water runs. 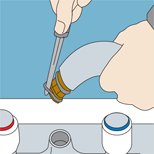 Unscrew the retaining screw, or if your tap works differently, tap and pull the spout off sharply. This should leave you with just the body of the tap. At the bottom of the spout you will find two O-rings. Make note of the location of each and remove them with a knife or sharp object. Purchase new O-rings and smear them with silicone grease. Fit them into the correct position on the base of the spout. Also smear the inside of the spout base with petroleum jelly and refit the tap.